Grapes could be one of the scariest toxins for dogs because of the perceived ‘health’ of offering fruit as a treat. While grapes, raisins, and the related Zante currant are perfectly healthy snacks for us humans, they can be kidney-destroying, and therefore life-threatening, to some dogs. At this point, we don’t know exactly what makes these foods toxic, and we don’t know exactly the number of grapes, raisins, or currants that must be eaten before a dog shows signs of toxicity. Also, it appears that not all dogs are susceptible to this toxicity, and there are currently no ways to predict which dogs are, and which aren’t. What we do know is that, in susceptible dogs, the ingestion of these common ‘people snacks’ can cause acute kidney failure. Kidney failure is an expensive condition to treat, and can cause long-term consequences – even death. So, while we in the veterinary world may not yet know everything there is to know about grape, raisin, and currant toxicity in dogs, we do know enough to strongly recommend that people never knowingly feed grapes, raisins, or currants to their dogs and that they take all reasonable and necessary steps to prevent their dog’s accidental exposure to them as well. While grapes, raisins, and currants are perfectly healthy snacks for humans, they can be life-threatening to dogs. The ingestion of these common ‘people snacks’ can cause acute kidney failure in dogs. Be sure to keep baked goods, cereals, and other foods that contain grapes, raisins, and currants out of reach of your dog as well. If your dog does eat any quantity of these foods, including those found in baked goods or cereals, contact your veterinarian or one of the veterinary-specific poison control hotlines immediately for advice. Don't intentionally feed any of these foods to your dogs. If you have children, be careful with dogs cleaning up after them. 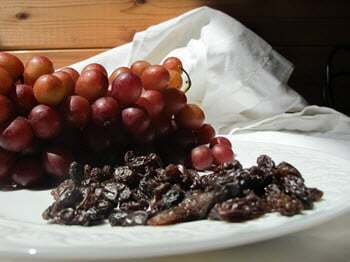 Grapes and raisins are common toddler snacks, and toddlers frequently drop what they are eating or want to share their snack with the family pets. Watch where your kids’ snacks fall, and clean up well when they are done. Recognize that grapes, raisins, and currants are present in other types of foods, too. They are especially common in cookies (oatmeal raisin) and cereal (raisin bran), as well as breads and granola bars. Be careful what you let your dog eat, and lock up the garbage so they can’t go scavenging. For you cat lovers, I want to point out that there is the possibility that grape and raisin toxicity may affect cats, though there have been no confirmed cases. However, it is wise to assume that it may be dangerous and to follow the recommendations above for cats as well.